Jason Holloway of Xenia (right) poses with Beavercreek’s Varun Lethra after the two played in the Fairborn Parks and Recreation Summer Tennis League’s Division A tournament final, earlier this month at Fairborn Community Park. Holloway defeated Lethra to claim his second straight Division A title. 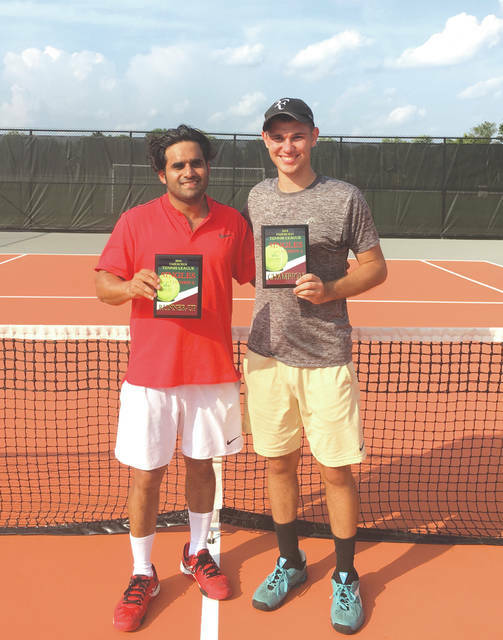 Beavercreek’s Thusitha Gunasekera defeated Beavercreek High School player Zach Savino in the Division B singles final of the Fairborn Parks and Recreation Summer Tennis League, earlier this month on the Fairborn Community Park tennis courts. Zach Savino (left) and Thusitha Gunasekera pose with their awards plaques after the two played in the Fairborn Parks and Recreation Summer Tennis League Division B single final, which was won by Gunasekera. Wes Biles and James White (right) won the Fairborn Parks and Rec B Doubles title over Kettering’s Harry and Patti Bromer. 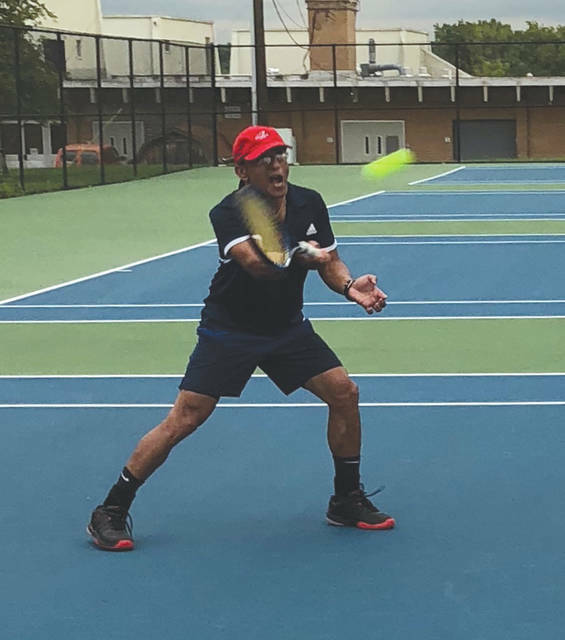 FAIRBORN — The Fairborn Parks and Recreation Summer Tennis League finished the Championship Playoffs recently. The top players in each division had a mini tournament to determine the Champions for 2018. In singles, the Division A champion was Jason Holloway who beat Varun Luthra. Holloway, a former Wright State player from Xenia Christian, wore down Varun of Beavercreek, on a hot day by running him all over the court. Holloway won for the second year in a row by the score of 6-4, 3-1, when Varun had to retire from the heat. In Division B, Thusitha Gunasekera of Beavercreek outlasted Zach Savino, a varsity Beavercreek player. Savino took the first set in a tiebreaker, but Gunasekera’s experience proved to be the difference. He came on strong in the second set to win 6-1 and won a deciding third-set super tiebreaker, 10-4, to win his second career Fairborn Summer Tennis League championship. In the Novice Division, the finals came down to Fairborn varsity players. 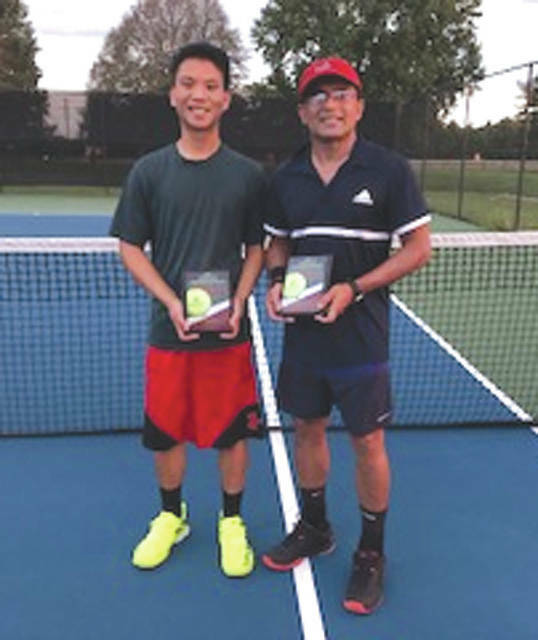 It was a back and forth match with Nghi Nguyen outlasting his Skyhawks teammate, Silas Smith, by the score of 6-4, 7-6 (7-5) to win the championship. In the doubles tournaments, the B Division had a new champion as the team of Huber Heights’ James White and Dayton’s Wes Biles beat the husband-wife team of Harry and Patti Bromer of Kettering. It was a close first set with the score tied at 4 all, until the White-Biles duo scored some great shots for winners to win 6-4. The Bromers had to default the second set due to illness, giving the championship to White-Biles. In the A Division, the team of Jason Holloway-Fernando Nardelli won due to being the regular winners during the season. The former Wright State players played the second-place team of Shannon Young-Matt Almazan twice during the season and beat them both times winning the last time with the score of 7-5, 6-2 to become the overall champs. It was a great season with many participants for the Fairborn Summer Tennis League. A lot of exciting tennis was played and much fun was enjoyed by all involved. https://www.fairborndailyherald.com/wp-content/uploads/sites/50/2018/09/web1_LuthraHollowayDivAsingles_PS.jpgJason Holloway of Xenia (right) poses with Beavercreek’s Varun Lethra after the two played in the Fairborn Parks and Recreation Summer Tennis League’s Division A tournament final, earlier this month at Fairborn Community Park. Holloway defeated Lethra to claim his second straight Division A title. Submitted photos. https://www.fairborndailyherald.com/wp-content/uploads/sites/50/2018/09/web1_GunesakeraVolley_PS.jpgBeavercreek’s Thusitha Gunasekera defeated Beavercreek High School player Zach Savino in the Division B singles final of the Fairborn Parks and Recreation Summer Tennis League, earlier this month on the Fairborn Community Park tennis courts. Submitted photos. https://www.fairborndailyherald.com/wp-content/uploads/sites/50/2018/09/web1_GunasekeraSavino_PS.jpgZach Savino (left) and Thusitha Gunasekera pose with their awards plaques after the two played in the Fairborn Parks and Recreation Summer Tennis League Division B single final, which was won by Gunasekera. Submitted photos. 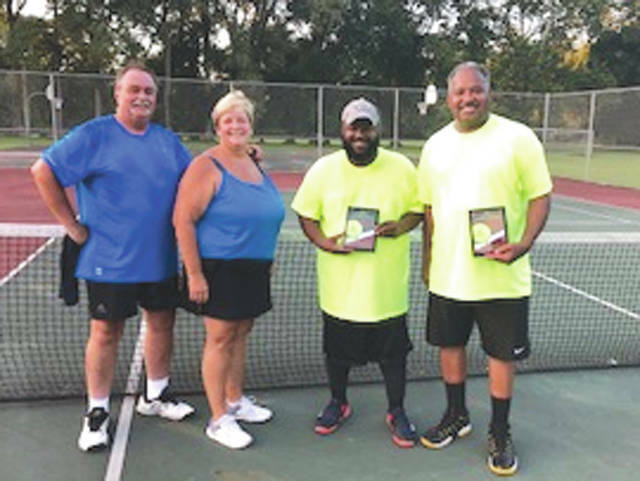 https://www.fairborndailyherald.com/wp-content/uploads/sites/50/2018/09/web1_BDoubles_PS.jpgWes Biles and James White (right) won the Fairborn Parks and Rec B Doubles title over Kettering’s Harry and Patti Bromer. Submitted photos. Story provided by Fairborn Parks and Recreation Summer Tennis League director Terry Miller.